For decades, individuals have been lectured to pick up trash, to turn off unused lights, to brush their teeth without running the faucet, and in recent years, the green movement has finally taken hold. In 8 out of 10 American homes, there is a recycling bin, and more than 90 percent of Americans have access to curbside recycling services. Solar panels are appearing on more and more homes around American suburbs, and even composting is catching on. At home, America is sustainable. However, most Americans do not spend their entire days at home; according to the Bureau of Labor Statistics, employed individuals spent more than half of their waking hours at the office or on the commute ― where they definitely weren’t being green. In fact, businesses are the most wasteful entities in America, and few are even trying to get better. Therefore, in one final attempt, I present a comprehensive list of reasons why businesses should strive to be more sustainable. Some of the most exciting technological releases of the past few years have concerned smart gadgets, which include everything from computers and phones to home thermostats and baby monitors. Smart tech offers a number of features that make it more valuable to users, especially its ability to collect data and make autonomous decisions, like lowering the temperature or using less water. It is no surprise that most companies and consumers are clamoring for more smart tech, which tends to save money, time, and energy in the long run. Thankfully, there are almost limitless opportunities for smart technology to be sustainable. Social media plays an important role in the success of the modern business. Companies generate and retain audiences through the careful curation of content on sites like Facebook and Pinterest. In simplistic terms, the more attention a business’s page gets, the more profits that business rakes in. However, not all attention is equal: On social media, bad news is definitely bad news. Businesses must strive to maintain a stellar reputation, especially one that supports the community and upholds widely held values ― like sustainability. Today’s consumers recognize they have the power to shape their world with their spending choices, and most have basic expectations that companies recycle and reduce greenhouse gas emissions. However, by engaging in good, green works and posting about it on social media, businesses can garner even more positive attention online. In less than a year, oil prices have gone from more than $70 per barrel to below $30. To ensure strong, stable profit margins, businesses must be able to predict their energy costs with some certainty, but as oil and other traditional energy sources become more and more unreliable, businesses should begin searching for more secure alternatives. Fortunately, most sustainable technology is uncontroversial and independent of interests that could raise or lower its associated costs. Thus, using sustainable energy sources, like wind and solar, mitigates many risks associated with traditional energy sources. In the past, most businesses were unwilling to devote the time and resources to developing more efficient technologies and techniques because the traditional ― albeit wasteful ― ways worked just fine. Indeed, creating green replacements is difficult, but many companies have shown that working toward sustainable solutions actually helps improve technology in other ways. For example, fabric structures cut energy usage by allowing natural light and employing recycled fibers and steel, yet they are much more durable and customizable than traditional buildings, making them more desirable in many industries. 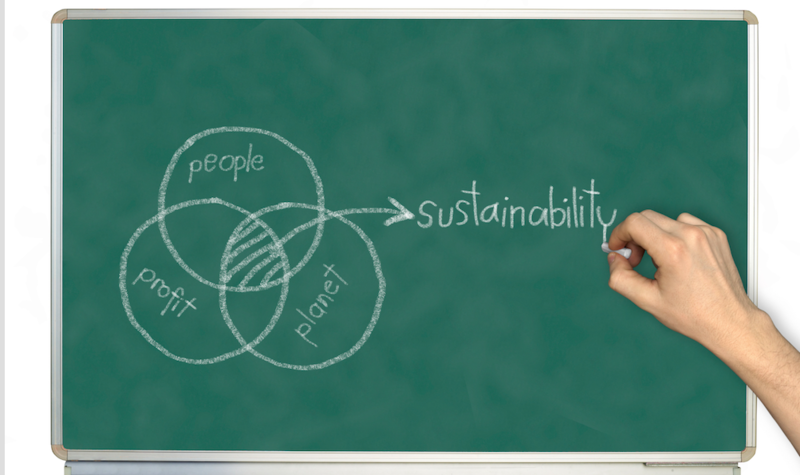 The drive to be more sustainable encourages innovation beyond environmental concerns. Business taxes can be brutal, but the United States (as well as many countries around the world) is more than happy to make tax season less painful if a company goes green. Federal and state governments reward sustainable corporate activities with the gambit of tax benefits, including credits, deductions, exemptions, abatements, and reductions. Eventually, there will be no more oil. Without careful planning, we will run out of clean, fresh water. Our sources of natural materials like wood, sand, stone, and clay are finite. However, renewable materials and energy are not. Businesses that adopt sustainable technologies today have the potential to outlast the consumable resources we currently rely on. The term “sustainability” has become so connected to the green movement that many forget its original meanings: long-term endurance. Companies must build toward sustainability in every way ― which means taking advantage of technology that won’t run out.